The driver installation under windows for your Sundtek USB TV device is very simple. Our drivers are successfully tested and functional on all 3 new Microsoft operating systems (Vista/XP/7). (1) First you need to download the driver package. Just click on the following link http://www.sundtek.de/support/BDA_WHQL_Standard_Installshield.zip and save the file in a directory. (2) As soon as your download is finished, create a new directory and extract the ZIP file into it. (3) Now it is time to begin with the installation, please plug the device into a free USB port of your system and ensure that the device is connected. (4) Vista will immediately detect your device and ask you for continuing the driver installation. At that stage you have two alternatives. You can either let Vista search after your device drivers and click on "Locate and install drivers" or continue with step 5. (5) If you already have plugged your device into your system before the driver got installed or you cancelled the automatic installation by Windows Vista, you should continue with this step. For this please go to Control Panel -> Add New Hardware. Now let Vista search for new hardware. After the search operation the name of your device (MediaTV Pro/ MediaTV Gold) should show up. (6) After this you will be asked for available drivers for your device. Now click onto Browse. Change to the directory where you extracted the driver to at the beginning of the installation. Depending on what operating system you have, 32 or 64 Bit change to the BDA32 or BDA64 directory. Choose the EMBDA file and continue the installation. (7) After a system reboot your device should be ready and functional. The installation under Windows XP and 7 is identical to Vista. 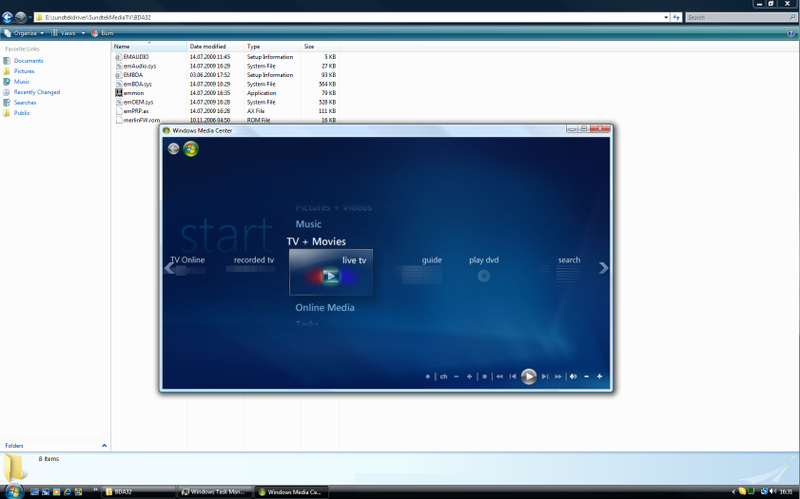 To prove the functionality of your stick start Windows Media Center and choose "LiveTV" from the menu. After the selection of "LiveTV" follow the instructions of Windows Mediacenter. Windows Mediacenter will scan for available channels. After this your TV is successfully installed. 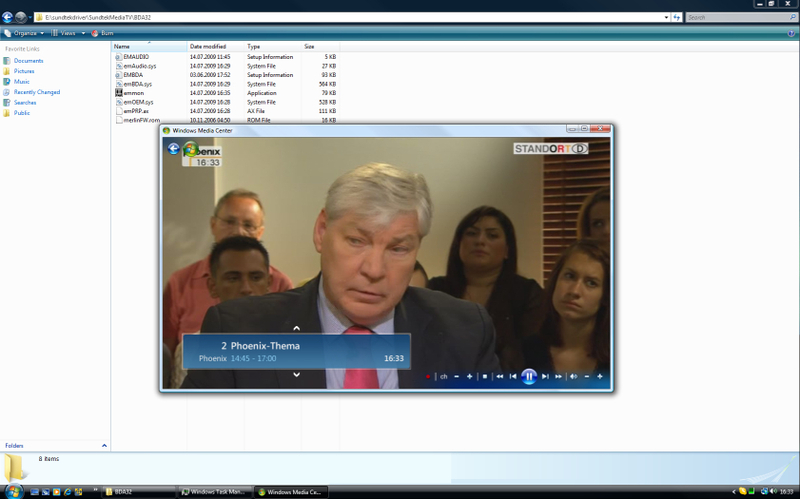 DVB-C is currently supported by ProgDVB and DVBViewer. Windows Mediacenter only supports Analog TV and DVB-T. The certified Windows 7 64/32 bit driver is now also available as announced on 24th December. Steckt der Tuner nun direkt an der Dose? Wie erwähnt bei Continuity Errors war es bis jetzt ausnahmslos immer das Kabel. Was für ein System ist denn das überhaupt? Wie sieht die CPU Auslastung aus? Wenn das nur ein Raspberry PI ist dann würde es mich nicht wundern, dann wäre es ein Performance Problem vom System.